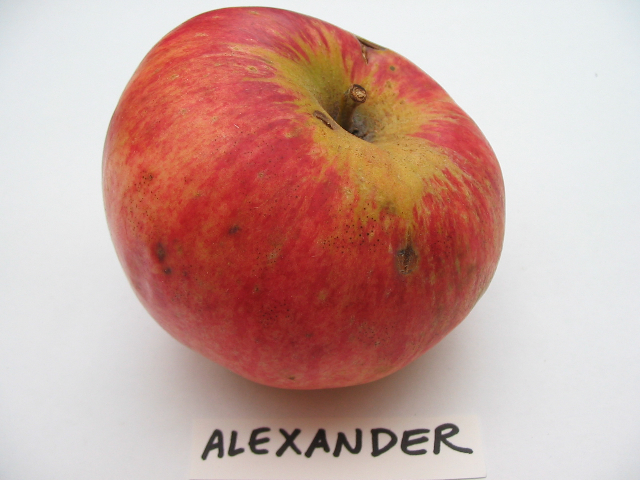 Alexander originated in the Ukraine, c 1700. It was originally called Aporta and was redubbed Alexander in honor of the Czar Alexander I (1777-1825). The tree first arrived in the U.S. in 1835 and quickly spread north to Aroostook County and other northern areas where the fruit can be picked over a several week period. The fruit are very large—often huge— and round-conic in shape. The pale yellow base color is faintly red-striped in the shade and brightly blushed orange-red in the sun. Alexander is more conic than its famous oblate child, Wolf River. The coarse, tender, juicy flesh, is best know for its cooking qualities, although it is also quite good for tart fresh eating. The vigorous upright spreading tree bears young and is a good cropper. It comes fairly true to type from seed, so there may be many strains out there. Best grown in zones 3-4.